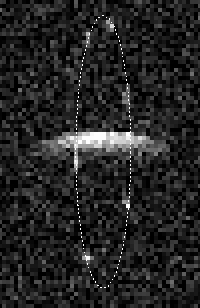 Observations of asteroid 2000 DP107 provided the first images of a binary asteroid in the near-Earth population. Results were published in 2002. 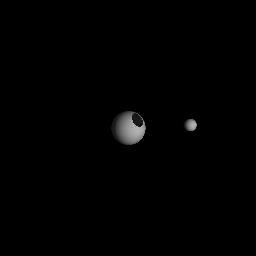 2000 DP107 and 1991 VH will be observable again in 2008 and provide exceptional opportunities to characterize the dynamics, morphology, and physical properties of two binary systems. High resolution images obtained over a suitable range of aspect angles will provide detailed information on the regolith, size, shape, and spin of the components and on their mutual orbit and dynamical interactions. In conjunction with pre-existing observations, these data will probe the formation and evolution of binaries in great detail, including processes such as avalanches, tides, librations, and YORP. 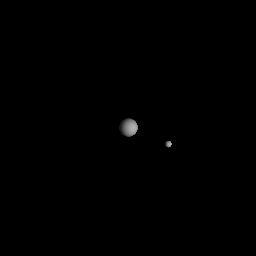 If the proposed observations are successful both systems will compete for the title of best characterized binary in the solar system. Below are some results and animations from our 2000 observations. In 2008 signal-to-noise will be 20 times higher, reaching 200 per run for 2000 DP107 and 1500 per run for 1991 VH, allowing very high quality images to be obtained at 8 m resolution. 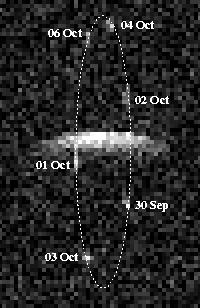 A composite of range-Doppler images of binary asteroid 2000 DP107 obtained at Arecibo Observatory 30 Sep-07 Oct 2000. The frame is 5.8 km vertically by 12.2 Hz horizontally, with range, or distance from the observer increasing downward while Doppler, or line-of-sight velocity with respect to the observer, increasing to the right. The resolutions are 75 m in range and 0.24 Hz (15 mm s-1 ) in Doppler. Rotation and revolution are counterclockwise. 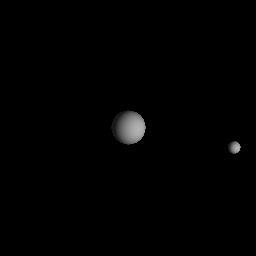 A roughly spherical primary is visible, as well as a secondary at different phases of the orbital cycle. In this representation the secondary appears much smaller than the primary because its spin rate is lower. The actual size ratio is ~8:3. The orbit appears elliptical in this range-Doppler representation but it is circular in space. A schematic diagram representing the sizes of the 2000 DP107 components and their separation, drawn to scale. Click on the image for larger size. A schematic diagram representing the sizes of the 2000 DP107 components and their separation, with the Golden Gate bridge for scale. Click on the image for larger size. A schematic diagram representing the sizes of the 2000 DP107 components and their separation, with the 320 meter high Eiffel tower for scale. Click on the image for larger size. Image and animation credits: J. L. Margot, Cornell University.